New for 2011. 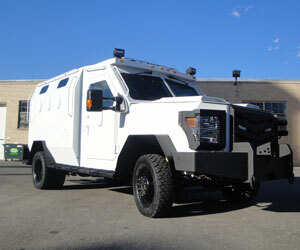 The BATT has a fully armored hood that provides maximum protection in a patrol sized vehicle. Armored to defeat high power armored piercing rounds and engineered to transport 12-14 officers in an urban and off-road setting the BATT maintains precision handling and the ability to sustain high speeds. A fully insulated BATT-AP will keep internal temperatures cooler for your officers. Stock unit available. The BATT XL is for those departments looking for the ultimate in armored protection and functionality. 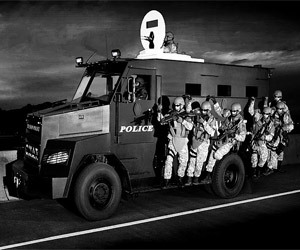 With the ability to carry 15+ fully geared officers, attain highway speeds up to 75 miles per hour, allow the ability to stand inside the rear officer’s compartment, deploy from multiple positions, and with the optional 4x4 package, the BATT XL becomes the most versatile armored tactical vehicle in the industry. Whether it is used for deploying a team into a hostile situation, rescuing a downed officer, or establishing an armored mobile command center, the BATT XL can provide the solution to your problems. The BATT XL can be armored to defeat .50 caliber rounds and is completely armored on 6 sides to insure the safety of its passengers. 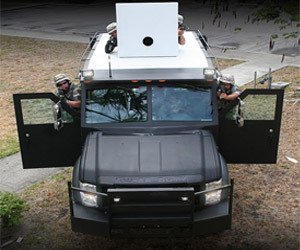 The BATT AP has a fully armored hood that provides maximum protection in a patrol sized vehicle. 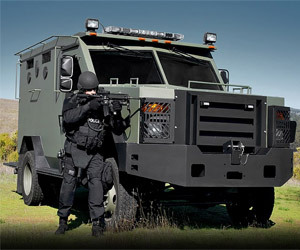 Armored to defeat high power armored piercing rounds and engineered to transport 12-14 officers in an urban and off-road setting the BATT maintains precision handling and the ability to sustain high speeds. A fully insulated BATT-AP will keep internal temperatures cooler for your officers. Stock unit available.